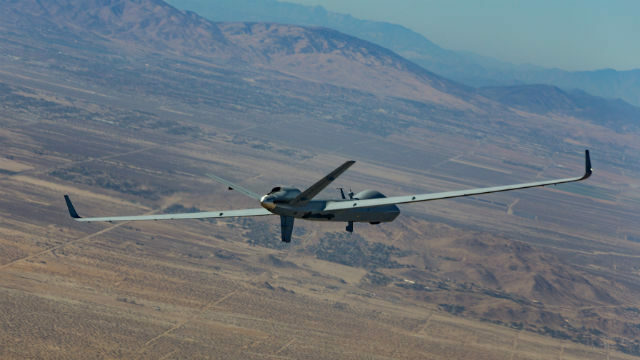 General Atomics Aeronautical Systems announced its MQ-9B SkyGuardian, a new version of the iconic Predator drone, set an endurance record of two days airborne. The aircraft took off May 16 from the Yuma Proving Grounds in Arizona with 6,065 pounds of fuel. The drone flew at altitudes between 25,000 and 35,000 feet and landed 48.2 hours later on May 18 with 280 pounds of reserve fuel. The San Diego company’s previous endurance record for a remotely piloted aircraft was held by a Predator XP, which flew 46.1 hours in February 2015. “This long-endurance flight is not only a significant achievement for our MQ-9B SkyGuardian aircraft but also a very timely landmark event for our company as we celebrate 25 years of aviation innovation this year,” said Linden Blue, CEO of the company. An armed version SkyGuardian is being acquired by the Royal Air Force under its the Protector program.